At our meeting yesterday Dawn and I reviewed our weekend spent at the NB Gathering of the Guilds in Moncton, April 22-24. We had a great time, and learned a lot about the other 17 NB guilds in attendance (actually I think there are 22 guilds, but only 18 attended). Each guild’s delegates made a 10 minute presentation regarding the guild activities – what has worked and what hasn’t. They also showed a few examples of their projects during the presentation, and 4 guilds (including ours) opened their hotel rooms for an hour or so on Saturday for a small “Show ‘n Tell”. Our guild is the only one in attendance that includes other crafts other than quilting. Another interesting facet to the gathering was the display of ads for many quilt teachers, wool dyers/applique shops, quilt fabric shops and other associated businesses across Canada. 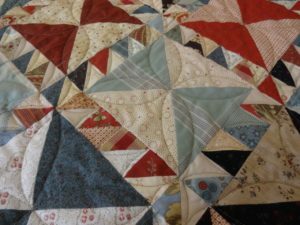 We were amazed at the number of people involved in the quilting industry in Canada, and were told that only about 40-50% of the people/companies contacted were represented. There were two sessions of particular note – one was a panel discussion regarding conflict in guilds. The panel members presented some hints and examples of how to resolve conflict within groups, and although we don’t have conflict in ours (that we are aware of anyway!) it was still good information to have. 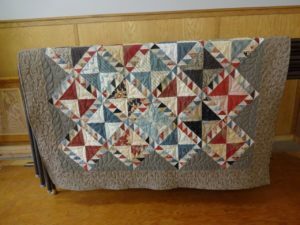 The second was a presentation by a quilt designer, Karen Neary from N.S., who spoke at length about copyright and it’s importance to her as well as to those who use her patterns. Her message could boil down to this: when you use someone’s design to make a quilt (or a sweater, a wood-carving, a hooked rug etc. ), you should give credit to the designer unless you significantly change the pattern. 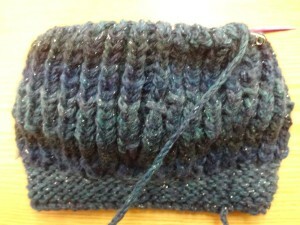 It is also not right to photocopy an original pattern and distribute it to others in a workshop for example. These guidelines are especially important if you are selling the item. Saturday evening we enjoyed a trunk show brought to Moncton by the Maritime Modern Quilt Guild located in Halifax. 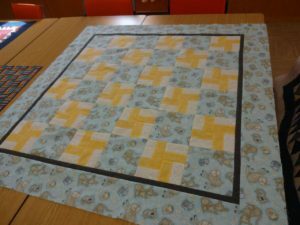 These ladies, many of whom are quite young compared to our group, make “modern” quilts – these quilts are often made with solid colour fabrics, lots of “negative space” of grey and white fabric, and most importantly, THERE ARE NO RULES! The presenters were so enthusiastic that Dawn and I stopped at Fabricville on our way to the ferry to buy some solids and some grey fabric. We also managed a quick stop on Friday afternoon at the Covered Bridge Quiltery in Moncton. Yesterday we were happy to welcome back Mary H. and Hilda S. to our group. Soon we will be gearing up for our show on July 8 and 9, with Mary H. as Convener. So get busy and prepare some of your work to display! Sorry about the tardiness of this letter – our internet was down for 3 days. Note to self – write the TTQNG email on Thursday afternoon! We had a good crowd on the 7th….great to see Joan F. back, if only for one gathering. We wish Joan the best for her future endeavours. Hope to see Joan back for a visit later in the season. Dawn and I had some items for show and tell, pictures below. Please bring your items for us to take to Moncton for Gathering of the Guilds this week! Dawn and I will be off to Moncton on the early boat on Friday to participate and represent our group, returning on Sunday. We want to have lots to show there, so we need your stuff! I’m writing this on the morning of April 8, after a wild night here on Grand Manan. For those of you who are not here at the moment, the highest gust on Swallowtail was reportedly 167 kph, and the stern of the ferry came loose from its moorings. Crew was called in to help tie her up again. Luckily there was someone aboard who could call in reinforcements. She may have bumped the old ferry wharf. Some dents in the hull are evident, but no major damage. She left on time at 7:30 am today. Rumour has it that the waves were washing over the fishermen’s wharf at high tide, around 2 am. Yesterday we had a moderate crowd, with delicious snacks as usual – this time thanks to Ruth. 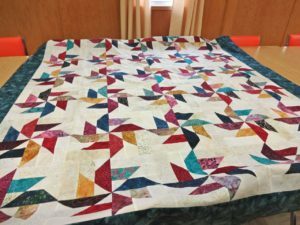 Dawn had her just completed quilt top, “Whirlwind”, which is destined to become the summer fund-raising quilt for the museum. Lovely colours, and a generous size. 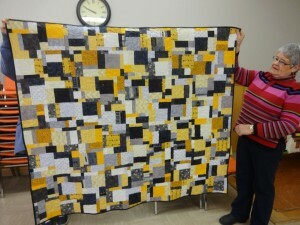 Dawn also had her yellow and black geometric quilt, which she is calling “Sunshine and Shadows”. It was great to see Sandra I. again. 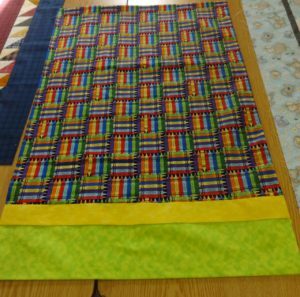 She shared her baseball quilt made for a grandson. I brought my quilt, “Cabins by the Shore”, a scrappy log cabin. 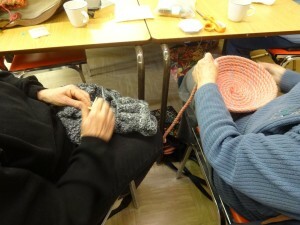 Our knitters were going great guns, as were our caner, Ce, and basket maker, Wendy. (See attached photos). We welcomed back Wendy D., Ce B., and Ineke D, all of whom were away for part or all of the winter. I’ve noticed that the GM “seasonal chickens” are returning to the roost. Hope to see more of you all in the near future! Members were reminded that Dawn and I are looking to take items from the group to Moncton for Gathering of the Guilds on April 22. Please bring in your display items over the next two Thursdays so we will have lots to share with the other guild delegates. We want knitting, hooking, baskets, crochet – as well as quilted items to take with us. In lieu of an official Show and Tell at the gathering, each guild will display their members’ items in their hotel rooms. 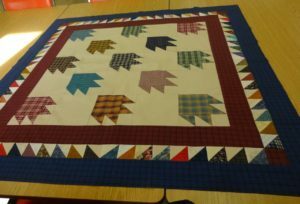 We will also be taking the Wings Over Water quilt, our little guild raffle quilt (hopefully it will be done! 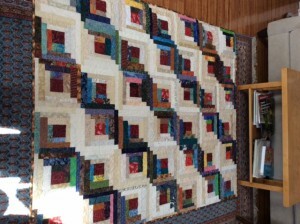 ), as well as one of each of our own quilts to show off. In addition we have prepared a summary of our past 2 years’ activities, a poster advertising our July quilt show (thanks to Mary H), and children’s pillow cases to give to the IWK. 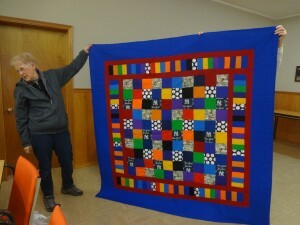 We are looking forward to touching base with other quilters in NB. Here’s hoping our wet and windy spring weather will soon calm down and warm up!